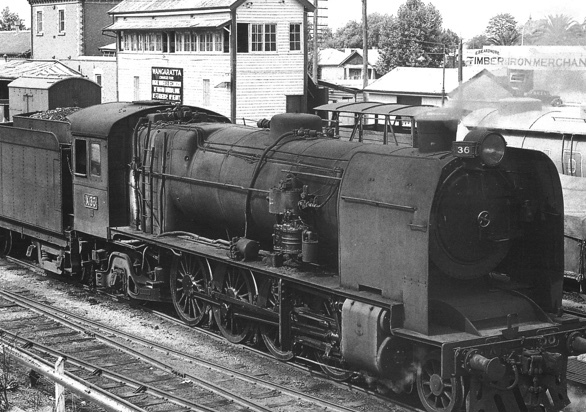 The X class 2-8-2 ‘Mikado’ ran on the Victorian Railways between 1929 and 1961 as a mainline goods locomotive. They were the most powerful goods locomotive on the VR until the advent of diesel-electric traction, and operated over the key Bendigo, Wodonga, and Gippsland mainlines. In 1949, X 32 was fitted with German 'Stug' (Studiengesellschaft) equipment and a specially modified tender for the burning of Pulverised Brown Coal (PBC). Initial trials were successful and the locomotive was considerably more powerful as a result of the conversion. X 32 was taken out of service in 1956 pending repairs, but was instead scrapped in 1957.